The Plains CO2 Reduction Partnership will have another two years of support for testing whether acid gas injection lowers emissions and enhances oil recovery at Apache's Zama Project. The power generation company's contribution pushes its financial commitment to $2.3 million in five years. A new methodology to assess the potential to store carbon in U.S. wetlands, forests, and rangelands ecosystems – and thus to reduce emissions of greenhouse gases to the atmosphere — will help find ways to mitigate the impacts of climate change. Researchers Robert Jackson and Mark Little took core samples from four drinking water aquifers and discovered that some sites may be more conducive to carbon dioxide storage than others. Through the Department of Energy's Geothermal Technologies Program, the company will apply $2 million toward its research on carbon dioxide-based geothermal power production. A study at the University of Liverpool has uncovered the substance's ability to store carbon dioxide and speed up particular chemical reactions. PNNL's Geologic Sequestration Software Suite is expected to be used in planning, deployment, and monitoring of carbon storage projects. Two different studies are using hollow fiber technology to test the removal of carbon dioxide from the flue gases of coal power plants. The Interagency Task Force on CCS told President Obama that there are no insurmountable technical, legal, institutional, or other barriers to the deployment of this technology. Ohio State University researcher William Mitsch says the 15-year experiment shows that the natural wetland seems stronger and the manmade wetland more diverse but both hold potential for carbon sequestration. The council will study future transportation fuels and prudent development of North American natural gas and oil resources during the 2010-2011 term. The $190,000 in grants will be used to further education and training for sustainable gardening, hazardous household waste disposal, carbon sequestration, and watershed protection. Using the Advanced Amine Process, the companies will test the efficiency of carbon dioxide capture at the Le Havre coal-fired electric power plant. New estimating method, which can be used on the regional scale, compares well with commonly used methods, according to study. Indiana University scientists measured nitrogen and phosphorus retention as well as carbon sequestration in tidal soils of three Georgia rivers. EPA is engaging the public, petroleum and natural gas companies, and those involved in geologic sequestration and emitting fluorinated gas in the discussion of new greenhouse gas reporting proposals. 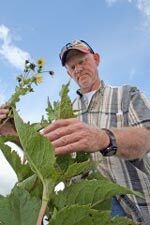 South Dakota State University is trying to determine if the cup plant can be grown on land unfit for crops. EPA is proposing that more industrial sectors should report their greenhouse gas emissions in 2012. NRG will receive up to $154 million to build a demonstration unit near Houston, Texas.